At last, ABC has announced its fall premiere dates for Fall 2013. 20/20 will officially kick-off its new season on Friday, Sept. 6 at 10pm. The actual series launches will begin on Monday, Sept. 16, as Dancing with the Stars premieres a week earlier than normal from 8-10pm to try and get a head start on the season and now that it doesn't have a Results Show, likely the first elimination will happen towards the end of the second week on Monday night. Dancing's Monday counterpart Castle will launch its new season a week later on the official start of the TV season on Monday, Sept. 23 at 10pm. ABC will launch their Friday series earlier this season, as the last few years they have used an hour on Fridays for encores. This season, all the 8-10pm series will premiere on Friday, Sept. 20 starting with the season premiere of Last Man Standing at 8pm followed by the new night for The Neighbors at 8:30pm. Then it's time to sink or swim with the sharks on an all-new season of Shark Tank at 9|8c leading into 20/20. ABC Tuesday will be brand new from top to bottom and all the shows will premiere on the same night on Tuesday, Sept. 24. First up, is probably the most anticipated new series of the season in Marvel's Agents of S.H.I.E.L.D. at 8pm leading into likely the most promising new family comedy of the season (and set in the '80s! ), The Goldbergs at 9pm. Fellow new family comedy Trophy Wife will follow at 9:30pm. At 10pm, ABC gambles with Lucky 7, a new drama that is a big swing. The next night, ABC Comedy Wednesday returns on Wednesday, Sept. 25 with a new season of laughs starting with the season premiere of The Middle at 8pm, followed by the series premiere of the new family comedy Back in the Game at 8:30pm. At 9pm, ABC will bring back its tentpole Modern Family with a special one-hour premiere event to launch the second season of the critically-acclaimed drama Nashville at 10pm. ABC's new comedy Super Fun Night starring Rebel Wilson will launch a week later on Wednesday, Oct. 2 at 9:30pm. Onto Thursdays, ABC will launch season ten of Grey's Anatomy with a special two-hour premiere event from 9-11pm on Thursday, Sept. 26. Sizzling drama Scandal will return the following week on Thursday, Oct. 3 at 10pm for its third season. ABC has not announced what will air at 8pm on the first two Thursdays of the season, but the Once Upon a Time spin-off series Once Upon a Time in Wonderland will premiere on Thursday, Oct 10 at 8|7c to try and help this time period. ABC Saturday Night College Football will air all fall on Saturday nights. And finally on Sundays, returning dramas Once Upon a Time and Revenge both return in their 8pm & 9pm time periods on Sunday, Sept. 29. New drama Betrayal will premiere at 10|9c also on Sept. 29. ABC will once again premiere America's Funniest Home Videos on the second week of the season on Sunday, Oct. 6 at 7pm. Probably a Once Upon a Time clip-show or season finale encore will once again air on the first Sunday of the season at 7pm, but stay tuned for details at a later date. 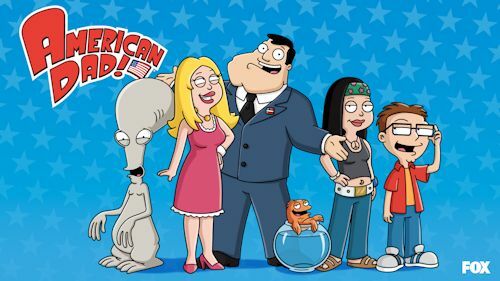 TBS has picked up Twentieth Century Fox Television's animated hit American Dad! as an original series, beginning with the show's 11th season in 2014. Created by Seth MacFarlane, Mike Barker and Matt Weitzman, American Dad! will join TBS's primetime lineup in late 2014. Sister network Adult Swim is set to present encores of each episode after initial airings on TBS. American Dad!, which will begin its 10th and final season on the Fox television network this fall, is executive-produced by MacFarlane, Barker and Weitzman. TBS has ordered 15 episodes for season 11. TBS and Adult Swim are no strangers to the Seth MacFarlane universe, having aired reruns of American Dad! and MacFarlane's Family Guy throughout the networks' lineups. TBS currently airs American Dad! reruns weekdays at 1 and 1:30 p.m. (ET/PT). Adult Swim presents reruns of the show Tuesday-Friday at 10 p.m. (ET/PT), Monday-Friday at 10:30 p.m. (ET/PT) and Saturdays at 9:30 p.m. (ET/PT). This is the second Fox comedy to move to cable. First was of course Futurama going from Fox to Comedy central, but that had a cancelation in between. American Dad! has aired non-stop on Fox and will move to TBS immediately following its run on Fox. Since premiering on Fox in 2005, American Dad! has earned several industry accolades, including two Emmy(R) nominations for Outstanding Animated Program, two Annie Award nominations and seven Teen Choice Award nominations. In 2012, it took home the top television series prize at the ASCAP Film & Television Music Awards. Stay with us for continued updates as we get closer to 2014.